Plants are 4-7″ in height once planted. 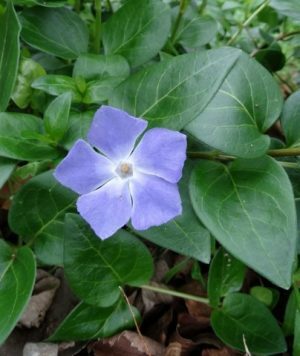 Bigleaf Periwinkle is essentially a large carbon copy of Lesser Periwinkle. 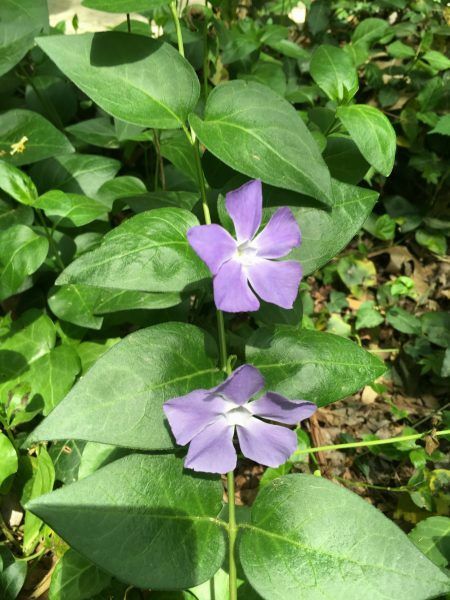 Also called Large, Blue, and Greater Periwinkle, the plant averages between 12 to 18″ high. It flowers well in full sun and the flowers often occur sporadically over the growing season. Bigleaf Periwinkle is originally native to the western Mediterranean and prefers moist, well-drained soils and shade. 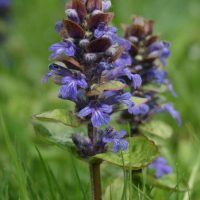 It makes a good evergreen perennial groundcover in dense shade. 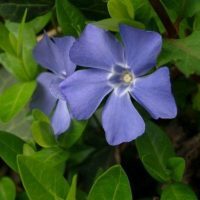 It shares many of the same characteristics as Lesser Periwinkle. More planting instruction can also be found at boydnursery.net/planting/. Leaves: Leaves are opposite, simple, evergreen and 1 to 3″ in length and about half to two-thirds as wide. Hardiness: Zone 3 to 8, can be grown further north when protected by snow. For an idea of your plant zone please visit the USDA Plant Hardiness Zone Map. Rate: Medium to fast; in a loose, organic, well drained soil will fill in very fast. 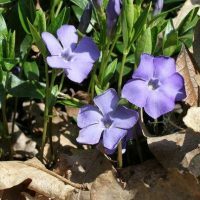 Flowers: Perfect, lilac-blue, 2.5″ diameter, March-April. Diseases & Insects: Blight, canker and dieback, leaf spots, and root rot; the canker and dieback (Phomopsis livella) disease have been significant problems, the shoots become dark brown, wilt, and die back to the surface of the soil. Soil Preference: Will grow in moist, well-drained, loamy, sandy or clay soils. Care: Deadhead after blooming and divide plants in fall or spring to keep them within their bounds. Fertilization: While decaying leaves are a suggested source of nutrition for the plant, you can fertilize with basic store bought plant foods (both slow release solid and water soluable) and manure for established plants every other year. It is recommended that you fertilize in the early spring of these years.